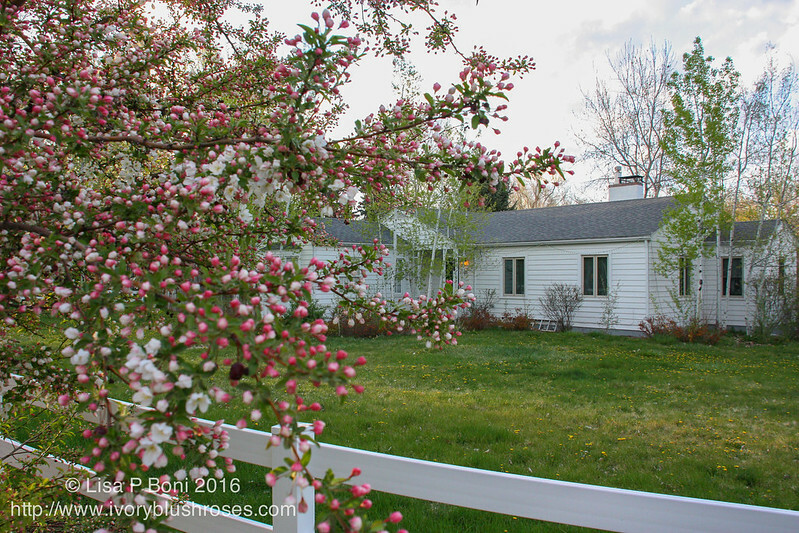 After all the snow and ice left, spring was still present at my house! I was so heartsick over how all that beauty was going to be lost with the snowstorm, but all over the area, it springing back! So very grateful! The nice thing is that the storm brought much needed moisture to our area ~ almost 3" of precipitation, which for arid Colorado is a lot! 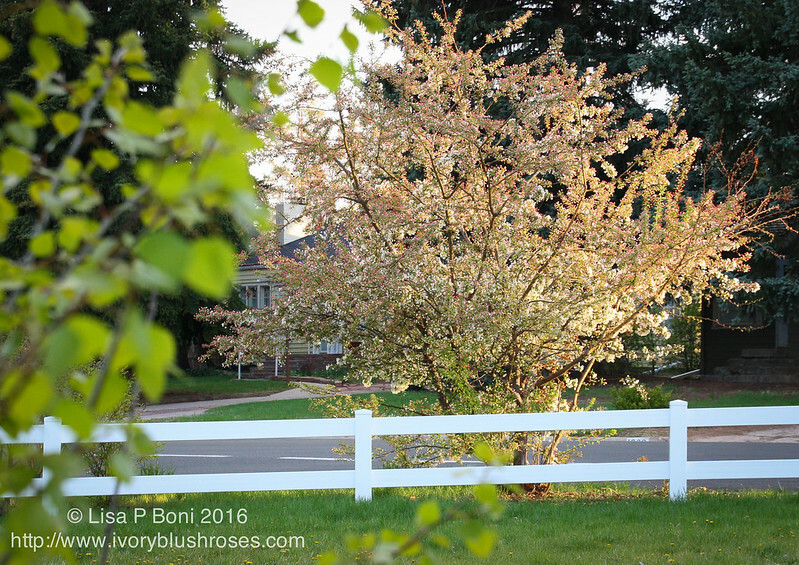 Last night, the evening sunshine lit up this crabapple tree with golden light and the sight of it drew me outside. This tree was still in bud when the snow hit and as you can see from the first photo, is still coming into its full glory. 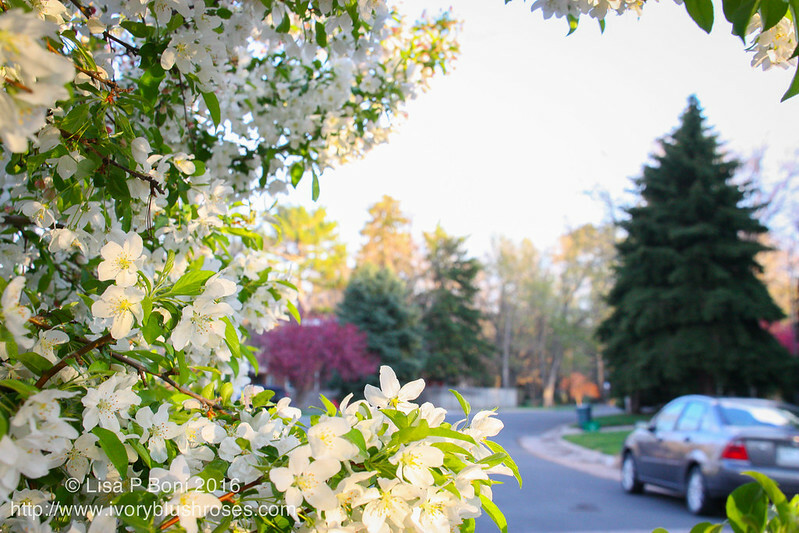 Even the tree that I photographed the day before the storm that was in full glorious bloom continues to bloom beautifully! 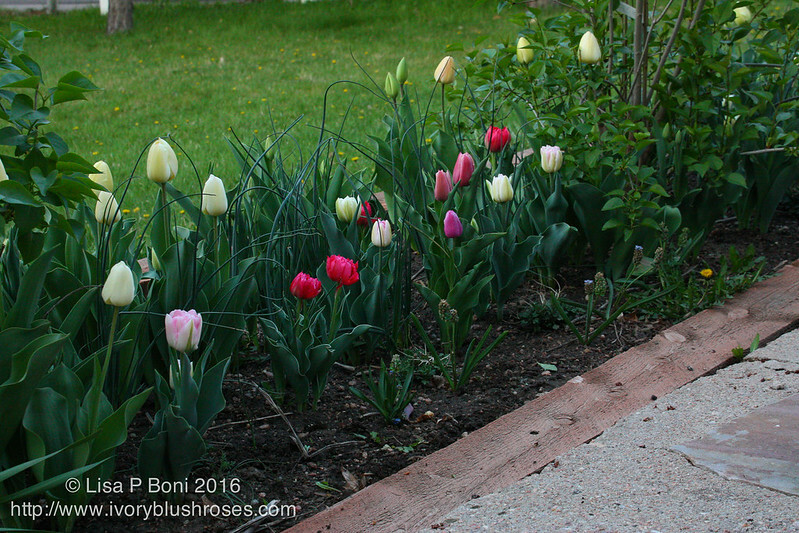 The forsythia retained its blossoms and the tulips all survived! 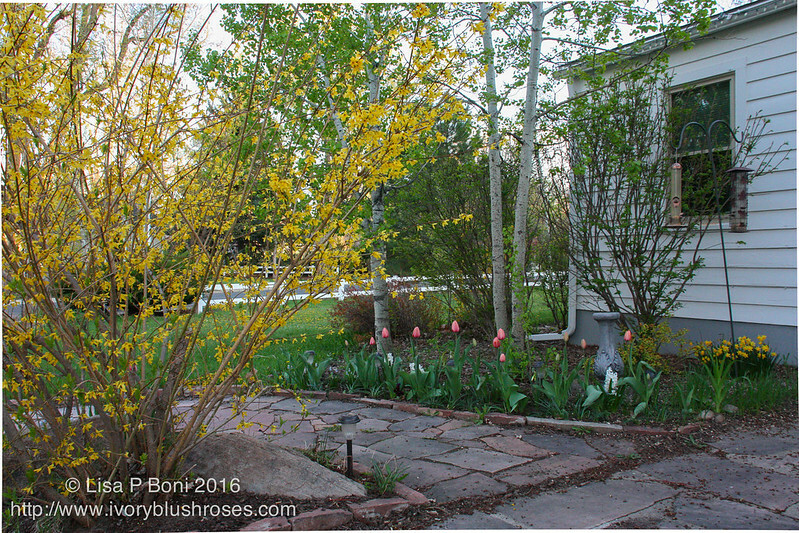 Along the side of the driveway, they continue forth in glorious abandon between the still blooming lilacs! 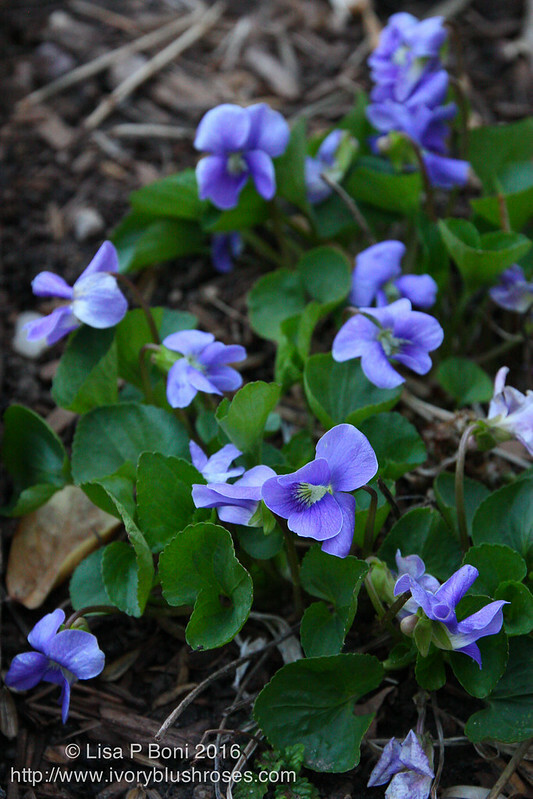 In the side garden, the violets are blooming! Inside, I've been stitching away on a few projects that I can't share just yet. I've also been playing with a few small things for the house. 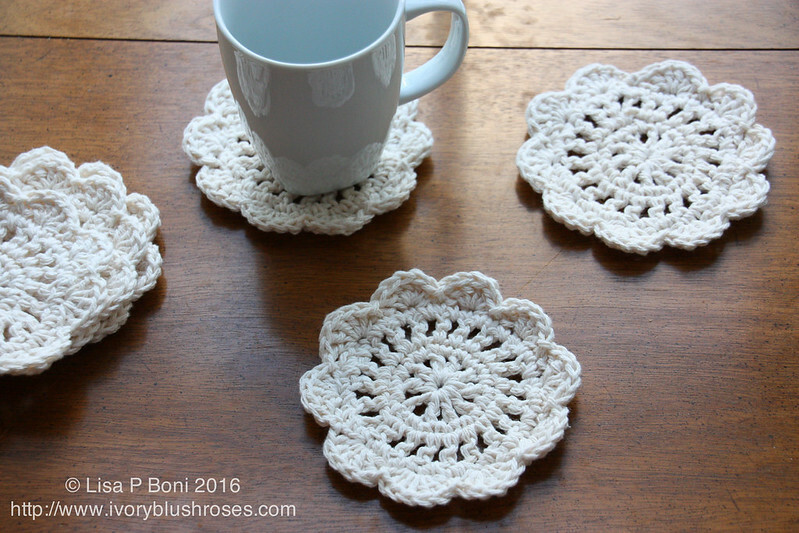 I found this pattern for these coasters on Pinterest and have been creating a stack of them in the evenings when I can't see well enough to stitch! Much better than the old worn out cork ones that I have been using! I'm SO glad that the beautiful flowers weren't damaged with the storm. Mother Nature is amazing! I recognize the Colorado light in your photos, colors seem to glow. We lived there for a while and enjoyed the scenery. Your stitching is beautiful. God surely has given you talent. So glad you still have much beauty to enjoy after the snowstorm.